1 A None No Power Seat 1 A has extra legroom but the proximity to the lavatory and galley may be bothersome. 1 D None No Power Seat 1 D has extra legroom but the proximity to the lavatory and galley may be bothersome. 1 F None No Power Seat 1 F has extra legroom but the proximity to the lavatory and galley may be bothersome. 10 A None No Power Seat 10 A is a standard Main Cabin Extra seat. 10 C None No Power Seat 10 C is a standard Main Cabin Extra seat. 10 D None No Power Seat 10 D is a standard Main Cabin Extra seat. 10 F None No Power Seat 10 F is a standard Main Cabin Extra seat. 11 A None No Power Seat 11 A is a standard Main Cabin Extra seat. 11 C None No Power Seat 11 C is a standard Main Cabin Extra seat. 11 D None No Power Seat 11 D is a standard Main Cabin Extra seat. 11 F None No Power Seat 11 F is a standard Main Cabin Extra seat. 18 A None No Power Seat 18 A is a standard Economy seat with a misaligned window. 18 F None No Power Seat 18 F is a standard Economy seat with a misaligned window. 19 A None No Power Seat 19 A is a standard Economy seat that has a misaligned window. 19 F None No Power Seat 19 F is a standard Economy seat that has a misaligned window. 20 A None No Power Seat 20 A is a standard Economy seat that has a misaligned window. 20 F None No Power Seat 20 F is a standard Economy seat that has a misaligned window. 22 C None No Power Seat 22 C is a standard Economy seat, however, the proximity to the lavatory and galley may be bothersome. 22 D None No Power Seat 22 D is a standard Economy seat, however, the proximity to the lavatory and galley may be bothersome. 23 A None No Power Seat 23 A may have limited recline. The proximity to the lavatory and galley may be bothersome. 23 C None No Power Seat 23 C may have limited recline. The proximity to the lavatory and galley may be bothersome. 23 D None No Power Seat 23 D may have limited recline. The proximity to the lavatory and galley may be bothersome. 23 F None No Power Seat 23 F may have limited recline. The proximity to the lavatory and galley may be bothersome. 8 A None No Power Seat 8 A has extra legroom due to the position of the bulkhead. 8 C None No Power Seat 8 C has extra legroom due to the position of the bulkhead. However, the seat is often bumped by other flyers. There is no floor storage available at this seat. 8 D None No Power Seat 8 D has extra legroom due to the position of the bulkhead. 8 F None No Power Seat 8 F has extra legroom due to the position of the bulkhead. 9 A None No Power Seat 9 A is a standard Main Cabin Extra seat. 9 C None No Power Seat 9 C is a standard Main Cabin Extra seat. 9 D None No Power Seat 9 D is a standard Main Cabin Extra seat. 9 F None No Power Seat 9 F is a standard Main Cabin Extra seat. The Embraer 175 is a small regional jet and is operated by Compass Airways and American Eagle on behalf of American Airlines. Any MCE seat on this aircraft is a great choice, but 8A, 8D, and 8F are especially good as there isn't a hard bulkhead limiting legroom. 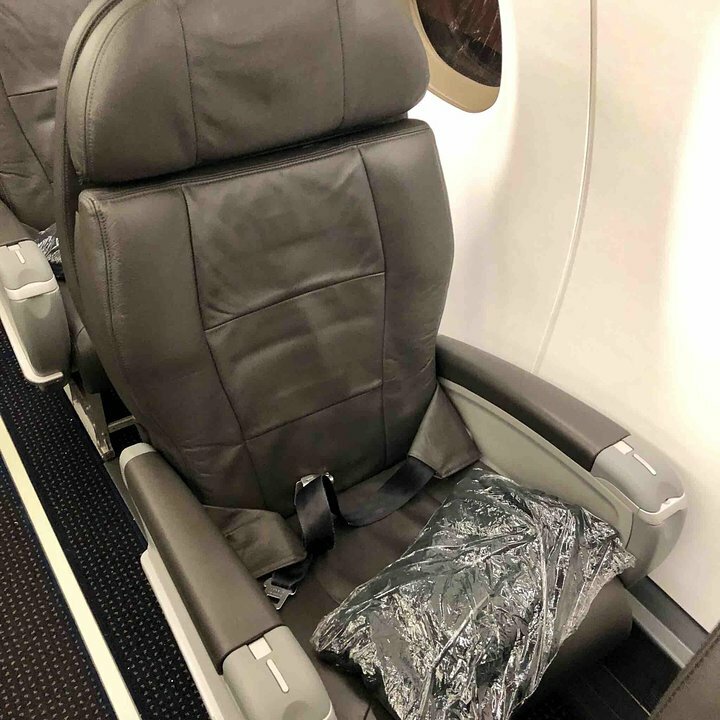 There is simply a half curtain blocking first class so you can push a bag under the seat in front of you and have effectively unlimited leg room too. 8C is not good though as it is in the aisle during boarding and doesn't have any floor storage. im 6'2 and my legs were really cramped up to the seat in front of me and im also a big guy too and it was uncomfrontable. A decent, comfy seat for a 1:15 hour flight from PHL to PIT. Service was very good. Lavatory were clean. A good seat for short distances. Would not want to fly this for more than a 2 hour flight though. First time flying this route via American Eagle. Seats were tight but not Spirit-level unbearable for the hour long flight. Biggest issue is the tray table. It is huge. Comes down right at the level of your stomach and juts into your belly a little if you're slouching forward. I can't imagine bigger people find this very comfortable. Overhead storage is quite tight, if your flight is full and everyone has roller-bags, you'll likely be checking at the gate. Otherwise, a fine plane for a quick flight. This is the best seat in the plane. I could see First Class seats from mine and I am sure I had more leg room. I'm 5'10" and this is the first time I could stretch my legs out and not be hitting/touching the seat or anything in front of me. Be aware, overhead storage is limited for the single seat configuration in First Class. It is half as deep as overheads on the rest of the plane. Its max capacity is a large purse or a student backpack turned sideways. The average carry-on bag will NOT fit, and the overheads on the two-seat side of the aisle are not big enough to compensate. I am a size 26, 5'10" woman, and seat 15A was one of the most miserable in-flight experiences I have ever had. My knees were crunched into the seat back so tightly that I actually scraped off skin trying to straighten them out. The average sized woman next to me wasn't in much better shape. I could not put down the tray table. The armrest against the fuselage was open enough that I could scoot left and avoid encroaching on her seat, but the knee pain forced me to change positions so much that it hardly mattered. The seat is the same as in main cabin extra, so the lumbar support should be good, but the loss of 4" of legroom completely negated that benefit. This is a great little regional jet in most respects. Actually has good overhead storage, premium seats offer benefits worthy of the premium fee, but AVOID the main cabin unless you are petite, short, or pre-pubescent. I am a size 26, 5'10" woman, and this Main Cabin Extra seat was more comfortable than first class seats in most regional jets. More than enough leg room, was able to put down the tray table fully, and almost didn't need a belt extender (missed it by an inch!). The arm rest against the fuselage was positioned in such a way that I could scoot under it a bit without discomfort, meaning I did not encroach upon the seat of my neighbor. Window properly aligned. Good lumbar support, too. This jet will definitely be my top choice for future business flights. BE CAREFUL that you don't get a main cabin seat, though. Accidentally booked one of those for my return flight and truly suffered the whole trip. Standard cheap seat with very little leg room. Fortunately, the flight from SGF to DFW was short. My knees didn't fit in front of me. MAX Legroom in this main cabin extra seat just behind 1st class. There is no wall dividing 1st class and this row so plenty of leg room. Seat tray pops out of arm rest. This is thebest seat on the plane 42 inches of leg room stowage above and under seat in front. Very quiet comfortable plane 2-2 configuration. No food or entertainment system but complimentary drink served. I flew from Baltimore to Chicago on an American Eagle ERJ-175. I had never heard of this plane before. But I really liked this little plane. the 2+2 seating was good. plenty of leg room, had no trouble falling asleep in the seat. I would take one of these over a 737 any day. A very comfortable seat. More than enough legroom (I'm 5'4" and had 5" between my knees and the back of the seat ahead of me), and plenty of space width wide. I had the opportunity to fly recently on an Alaska Airlines flight from Minneapolis (MSP) to San Diego (SAN) and back the following week. I had the good fortune to upgrade from Premium Economy (not bad) to First Class (wonderful). Single-wide seats are a brilliant blessing in today's "cram 'em in like sardines" airline economy. 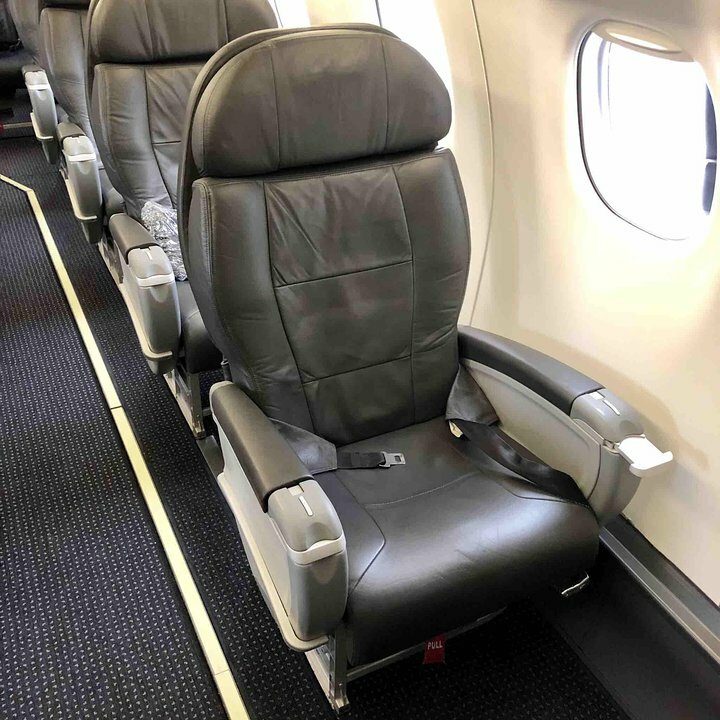 Sure, I miss having power outlets (not even USB), headphone jacks, and no LCD television console, but the joy-- THE JOY!-- of being able to sit normally in a seat without my knees being crushed or my sides smashed (I'm 6 feet tall and about 270 pounds-- I'm no svelte jetsetter) was so wonderful. Haven't been this comfortable since the Boeing 727. 14C is a Standard Economy seat. Ample leg room. I am 6'4" 265 lbs and had enough room for my feet with my backpack under the seat in front of me. My knees were in the way a little while the tray tables were down. Very cold seat, there is a constant flow of cold air, Flight attendants were not able to help. Amazing leg room. It doesn't make sense how much you get. I was loving every second of it. This plane is very comfortable & staff was the best I have experienced in a long time! (Ernest & Heather) I will fly ERJ-175 anytime I get the chance! This seat was great. Lots of leg room! Totally worth the price! Do not be afraid to book this seat! I like this seat because as mentioned you have almost an unlimited amount of leg room because the seat is positioned essentially in the middle of the "first class" isle. In regards to personal item space, this seat is limited because you have to share the space under the seat in front of you with the person in seat 8A or 8D. I only take a small laptop bag and there is always more than enough room. Not a traditional bulkhead in that there is no wall. You can put your bag under the seat in front of you, its simply set two seat widths in front of you. Ample leg room. The window is mislligned on these seats so it is quite uncomfortable trying to look outside. Window is at your shoulder. Comments apply to 16F, 17F, 18F and most likely other seats behind. Would also apply the the corresponding A seats. I love this aircraft and this seat was very comfortable with plenty of leg room. I'm a big guy and this is by far the most comfortable flight I have been on. Great seat -- no bulkhead, storage under 1st-class seat ahead. Loads of legroom. Tray table is in the armrest, so you probably lose a little width, but I'm not Kevin Smith, so I don't mind. Overhead bins DO accept roller bags. Overall, nice, new plane. Clean, quiet. Still has a little of that "new plane smell." Good overall seats in front of the wing. No power outlets or plug ins. The headrest on 9A would not stay up. These 2 seats have plenty of leg room. there is not a bulkhead just a curtain between first and mc. 8C is set up that if you stretch out your legs they are in the aisle especially right leg. 8D/F across the aisle have more pitch than first class seats but obviously narrower. Found our seats 8A/C very comfortable These seats are MCX and will cost if you do not have status. SFO to LAX, seat 1A. Pro's: individual seat, bulkhead, large amount of leg room. Cons: Only one window, light from galley shines in your eyes (FA on this flight was really considerate about turning it out for this 0600am flight), no overhead bins above this seat because the safety equipment is stored here. You cannot keep anything at your feet, so board early to stow things in the bin across the aisle. The "Eagle's Nest" / remote terminal at LAX is a nightmare: crowded, chaotic, and only accessible by dirty crowded shuttle buses. Tons of room in this seat behind 1 class. I am 6'4 and can fully stretch out. No actual bulkhead wall. No power. 2 windows at my control. Very impressed with these new jets. Comfortable seats, nice leg room. I like the fact that there is no barrier in the storage area under the seat in front of you, so your legs and bags are not confined to the same narrow slot. Quiet and comfortable. There is a curtain that separates first class from economy and it serves no purpose other than to smack into the legs of the person sitting in this seat. Excellent fat seat. Not worth upgrading, in my opinion, hardly any difference. Flew 7am flight from SFO to LAX. Upgrade list is short - but booked seat 8F - and had PLENTY of legroom as there's a big space between the seat and the first class section. The legroom was amazing. I am 5'10" and was traveling with an infant and had PLENTY of room. I can't say there was an extra girth in terms of the seat and it was a little cramped with someone next to me but definitely worth the upgraded price. The E-75 in the AA fleet has among the most comfortable economy seats in their domestic fleet. Very comfortable with adjustable headrest. This was right behind first class, so the legroom was fantastic. This is a Main Cabin Extra seat, and well worth the price, depending on the length of your flight. We flew from Reno to LAX. I'm sitting on one of these right now and it's very unpleasant. It's extremely cramped and very bumpy. This is a 3 hour (!) flight. Frankly, I can't believe American Airlines would allow this type of poobox for anything but a regional flight. Maybe they just hate their customers. This was a very nice plane and practically new. I wish American would only fly these regional aircraft. The overhead bins are big enough to accommodate roller bags, meaning you do not have to gate check your bag! The seat was comfortable and is the same type as those used on American's mainline fleet. I flew this plane from PIT - JFK. Great feel for first class in this commuter plane. Great service from the FA. Love this aircraft and would fly it again. I was seated in 22A and even though its by the bathrooms...I was not effected. Legroom not really that good and its seems a little tight. I would recommend sitting in first class it you have long legs. In my opinion, this is the best seat on the airplane outside of first class. Leg room is plentiful and as on all the AA E75s, width is great. Also being upfront you get off quickly and beverage service early enough to actually enjoy it. So happy AA replaced the awful CRJ200s on this route. Very comfortable in coach. Doesn't feel like an RJ at all. Seats were wide and legroom was adequate. I certainly recommend any of the larger (E170 or 190 class) Embraers over a 737 or A320 (and CERTAINLY over a CRJ), provided it's a shorter flight and you don't care about IFE. Very comfortable. I highly recommend this seat since it has great leg room, and it has a really comfortable cushion on the seat. These seats are wider than those on B737s. The main cabin extra leg room is wonderful. This aircraft is more comfortable than B737 for the economy class in my opinions. In between windows, you have control of neither. Good overhead storage space. A good seat, (15F). They serve drinks 2 times on my route From Hartford, Connecticut, to Chicago, Illinois. It was sort of bumpy, but relaxing. Always loved an Embraer. One of the most comfortable seats I've ever sat in on a flight! We paid for extra leg room, and there was plenty for me (5'6"). Even when the woman in front of me put her seat all the way back, it didn't take anything away from my leg room. The seat was a bit wider than usual too. Granted, no one really NEEDS a first class seat for a 38 minutes flight, but it is kind of cute. 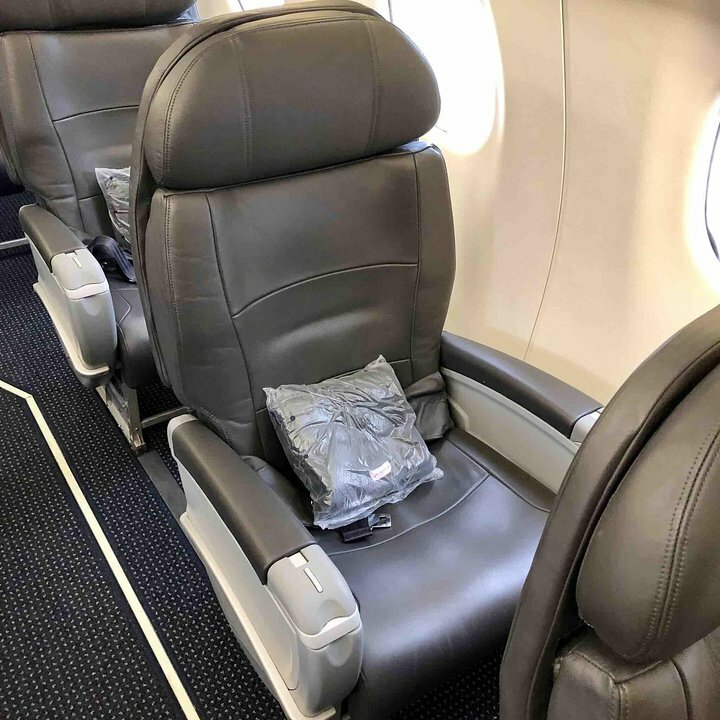 The seat is similar to most domestic first class seats, with the added benefits of being window and aisle, and the "new plane smell". I would not spend any extra money on it. But if you have some miles or upgrade certificates to burn - enjoy the ride! Seat is pretty standard for first class. Its not overly comfortable but its very roomy. There is only a curtain separating this seat from main cabin so i could see a situation where seat kickers would be a problem. However, since that first row is MCE, it may deter some of the normal rif-raf. Very comfortable seat. 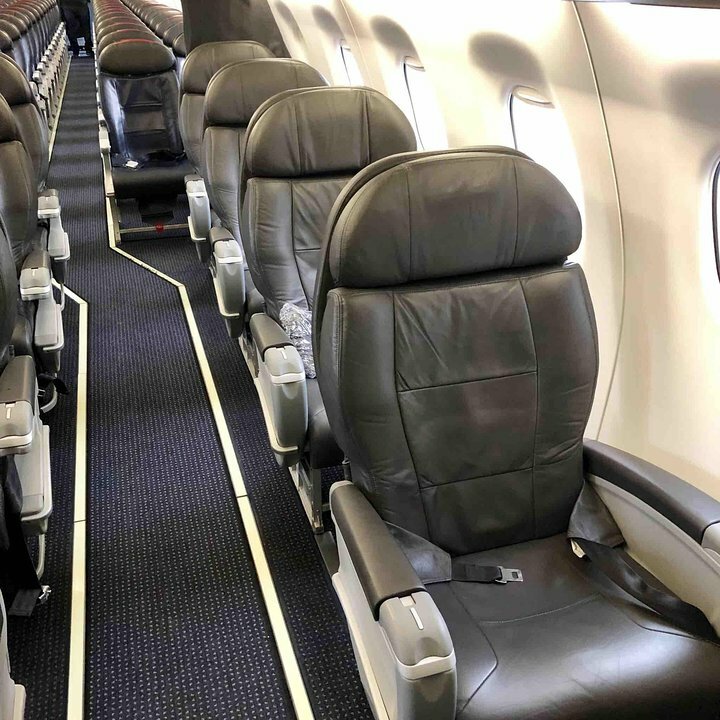 I was dreading flying nonstop San Antonio - LAX on a commuter jet, because the seats are usually like boards. 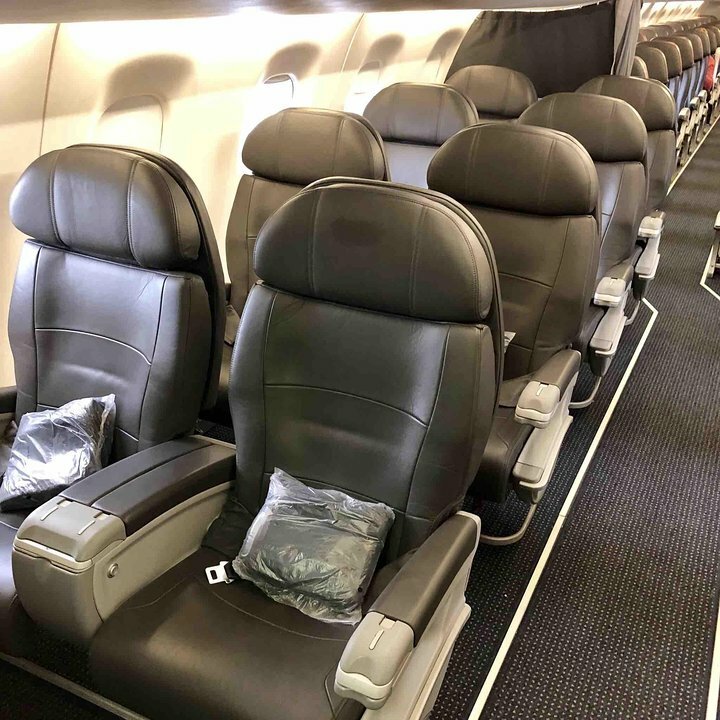 But the seats on the new AA ERJ-175 are excellent - better than the new Recaro slimline coach seats Alaska (my main carrier) has installed in their 737s. Good job AA on the comfortable seats in an RJ - an unusual accomplishment. 1A (SFO to LAX) was a fine seat - extra leg room, very private. 1D & 1F would be a little less private, as the flight attendant faces them more directly when in the jump seat. New plane, only 3 weeks old, everything in good condition. The overhead bins on the left (A, C seats) side of the plane are much smaller than on the right. Overhead space runs out quickly, and there is no gate checking -- checked bags have to be picked up at baggage claim, not at the gate. Board early, or check your bag. Overall, this plane is fine for a short flight. Window is directly aligned with shoulder, slightly too far back for a comfortable view. If you enjoy watching the ground beneath you, you will have to turn your head completely sideways for a good view and have a sore neck after even a short flight. The E175's are brand new planes, at least for AA. For US Air, these tend to be older and well used planes. This is my favorite regional jet because at least some passengers can put carry-on roller board luggage overhead. Note that when overhead bin space is full you must check luggage at gate and pickup at baggage claim. This plane does not offer 'valet" luggage check at gate like the smaller regional jets.